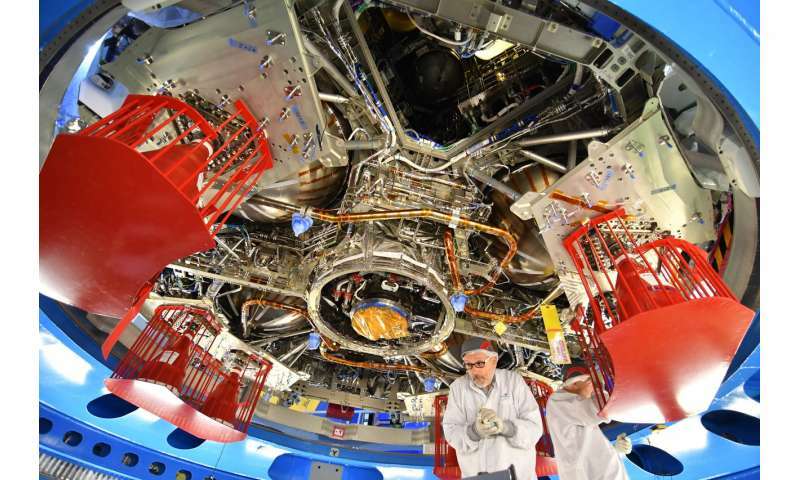 Last week at the Airbus integration hall in Bremen, Germany, technicians installed the last radiator on the European Service Module for NASA's Orion spacecraft marking the module's finished integration. ESA's European service module will provide power, water, air and electricity to NASA's Orion exploration spacecraft that will eventually fly beyond the Moon with astronauts. The European Service Module is now complete for Orion's first mission that will do a lunar fly-by without astronauts to demonstrate the spacecraft's capabilities. 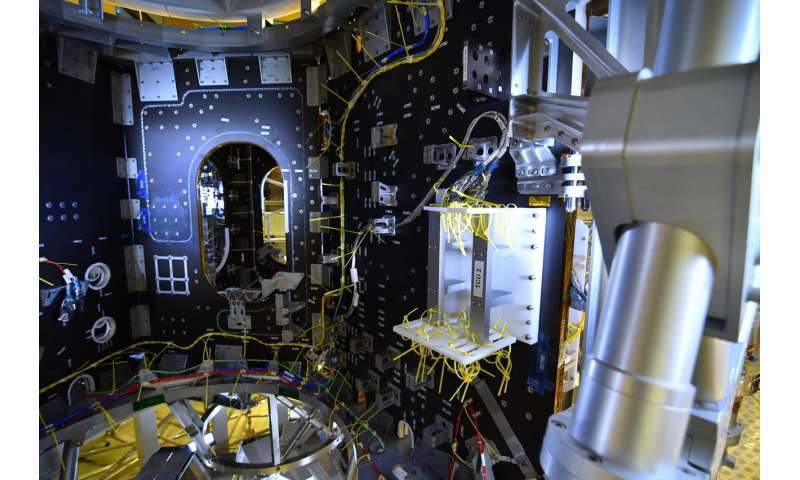 Technicians worked 24 hours a day in three shifts to complete the service module's assembly which is now going through the last stages of its extensive testing. 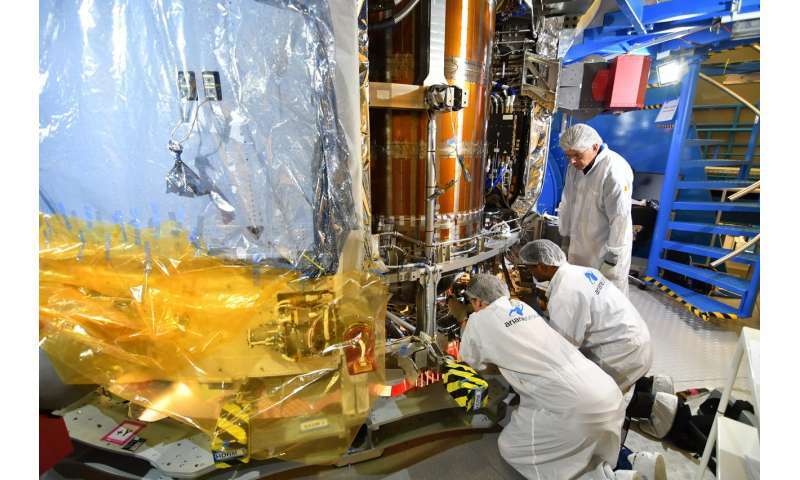 Engineers will put the module through its paces with functional tests that include checking the newly installed radiators and testing the propulsion system with its intricate pipelines that deliver fuel and oxidiser to the spacecraft's 33 engines. Once complete the service module will be packed and flown to NASA's Kennedy Space Center in Florida, USA. Orion's solar wings will be shipped separately, also from Bremen. In the USA the module will be stacked together with NASA's Crew Module Adaptor and Crew Module, the first time the complete spacecraft will be on display. More tests await the Orion spacecraft at NASA's Plum Brook facility where it will be put in the world's largest vacuum chamber to simulate spaceflight as well as being subjected to acoustic tests to simulate the intense vibrations Orion will endure when launched on the world's largest rocket, NASA's Space Launch Systems. Meanwhile technicians in Bremen are not resting as work on the second European Service Module is already well under way. The structure is complete and over 11 km of cables are being meticulously placed in preparation for the computers and equipment that will keep astronauts alive and well for the second Orion mission called Exploration Mission-2. The difference between BFR and orion: orion is a military vehicle built by a military agency to milspec requirements, intended to be used for military missions. This is the reason for the cost, the schedule, the complexity, and the international involvement. Recon, establishing bridgeheads, outpost support... these are military ops, some of the many that this system will be used to perform.